The holiday season brings the usual suspects: Bing Crosby, Andy Williams, Johnny Mathis, and even Crosby's bizarre duet with David Bowie on "The Little Drummer Boy/Peace on Earth." While these artists and their classic Christmas carols certainly evoke warm emotions, sometimes you just have to have a little soul with your holiday tunes. For the next few weeks, DeepSoul will focus on some of the best R&B-flavored carols, twists on traditional songs, and original tunes that perfectly compliment this festive season. There are few better songs to kick off the series than The Drifters' doo-wop take on "White Christmas." The story of this seminal group has been well documented: their association with such top songwriters as Jerry Leiber and Mike Stoller as well as Gerry Goffin and Carole King produced numerous chart-topping hits. From 1953-1966, their tenure on Atlantic Records spawned standards such as "Up on the Roof," "On Broadway," "Under the Boardwalk," "This Magic Moment," "There Goes My Baby," and "Save the Last Dance for Me." 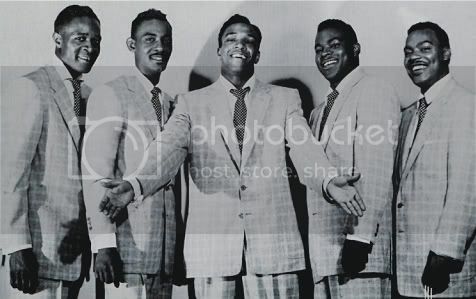 The original lineup, led by lead vocalist Clyde McPhatter (who, as a solo artist, later scored hits such as "Lover Please" and "Little Bitty Pretty One"), lasted from only 1953-54. However, McPhatter and the group released a series of stellar singles, including their radical remake of "White Christmas." Crosby's iconic version may be hard to equal, but the Drifters' upbeat take featuring the group's signature harmonies remains almost as popular as the original. The original release of the Drifters' "White Christmas" causes confusion--the song first debuted in December 1954, reaching number two on Billboard's Rhythm & Blues Records chart. But the song did not cross over to the Billboard Top 100 singles chart until the following year, where it peaked at number 80. In addition, although the song featured McPhatter on vocals, he had already departed the group by the time Atlantic released the single. Regardless of these details, their remake of "White Christmas" has gone on to become part of the holiday canon. What makes their version so unique? First, the Drifters increased the tempo; next, they stripped the song to just its bare elements--drums and their incredible voices. Finally, they added intricate doo-wop arrangements, with each voice imitating a guitar and bass, or accenting the drummer's soft rhythms. McPhatter sings tenor, but Drifters member Bill Pickney handles the lower register; both voices complement each other as they trade verses. Anyone who doubts the group's ability to harmonize need only listen to the final bars: the slight backing music drops out, leaving the members' voices to use their full range, also alternating in volume. Simply put, the entire song is a tour-de-force by a truly gifted vocal group, and it turns a melancholy song into a true celebration of the season. The video below plays the entire track; for another fun visual interpretation, view this charming animated Santa and his reindeer performing the classic.